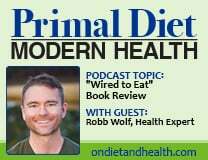 What’s the latest craze in nutrient dense foods? 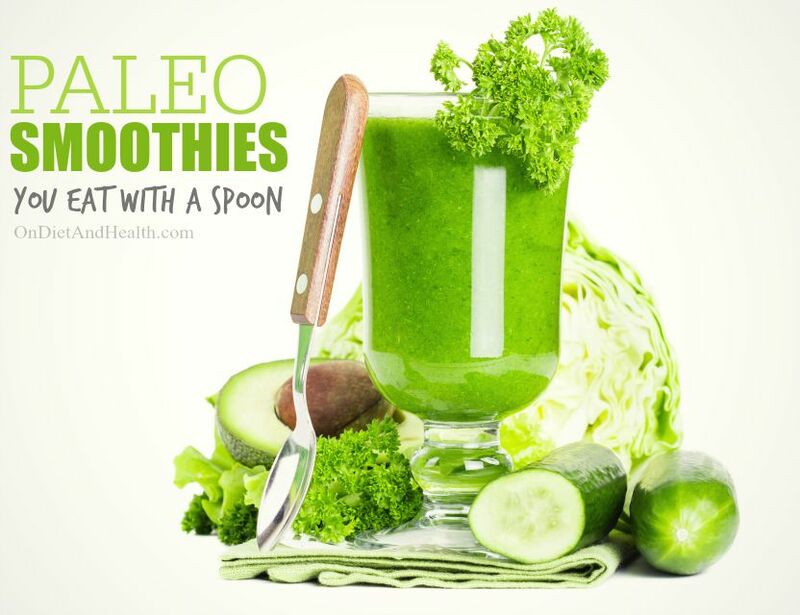 Paleo Smoothies you eat with a spoon! We call them Smoothie Bowls but mine are low in carbs unlike most Smoothie Bowls. Forget the old fruit and juice smoothie. Even if you add protein powder, it’s too much sugar and will leave you tired, hungry and moody all day. Blending raw or blanched veggies with others foods and spices makes a colorful Salad in a Glass! You can vary it daily, choosing ingredients you (and your family) like best. Eat these Paleo Smoothies with a spoon, not a straw. By reducing the fluid, you’ll have a thicker mix. In general I like to reduce fluids with meals to keep stomach acids and enzymes from being diluted. Most vegetables are high in water content so you don’t need much fluid. Try a little coconut milk, herb tea, bone broth or water and the Nutri Bullet, Blendtec or VitaMix reduce handfuls of food to a small colorful pudding. (Shopper’s Note: The Vitamix Amazon link is to a refurbished one, and you can get a refurbished Blendtec too). Call it a Paleo Smoothie Bowl or Slurpee and your kids may ask for one and offer to help too! It’s a chemistry experiment you get to eat, altering the taste, texture and color by your choice of foods. Each one will be different, depending on what you’ve got on hand. If it doesn’t turn out like you expected, change the taste easily by adding a flavorful ingredient such as cinnamon or cucumber. Raw foods have intact enzymes and vitamins. That’s good…. my personal goal is 8 cups of compacted (cooked or blended) vegetables daily. Leafy greens have to be wilted first to count them towards my goal. For example, 10 cups of spinach makes only 2 cups of wilted spinach. Raw leafy greens look like a lot of food but cook or blend down to almost nothing. raw cruciferous veggies contain goitregens which block iodine from the thyroid. If you eat a lot of kale, collards or other crucifers, you should blanch them quickly before blending (or blanch and cool the day before). This is especially true if you are Hypothyroid. A little raw kale or collards everyday is OK.
spinach is high in oxalates which reduce mineral absorption and can cause kidney stones. Baby spinach is safer than mature, but don’t eat cups full of raw spinach every day. Save some to cook into your omelet or Quiche where the cooking breaks down the oxalates. Yep, you need to chew your Paleo Pudding. 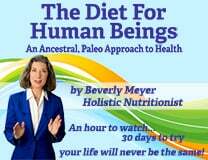 It’s a nutrient dense food that needs salivary enzymes to help digest it. Take your time and enjoy it. It’s very filling and you’ll be getting a real meal out of this. Blending your veggies does help pre-digest and pre-chew the food for you. It’s faster to eat a Vegetable Slurpee than to chew on a bowl of salad for half an hour. And it’s still raw so it contains the enzymes and vitamins intact. 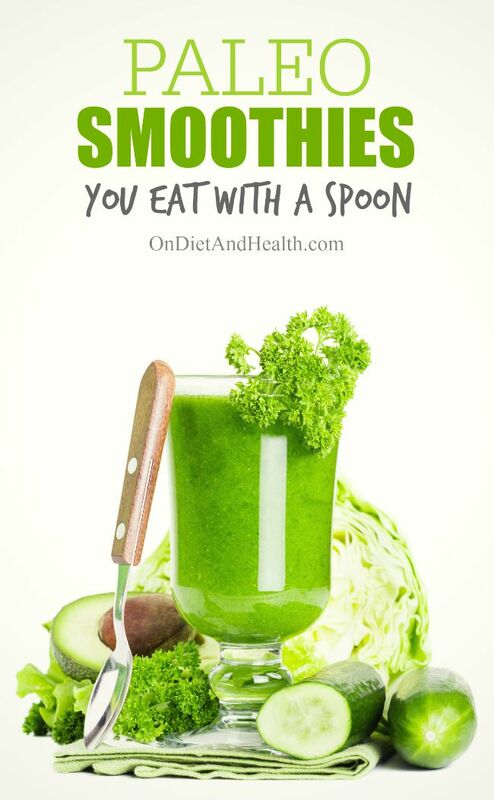 You get a lot of food reduced to a cup or two of Vegetable Smoothie, as much as a huge salad bowl. Add protein and fat and you’ve got a complete meal. Like every balanced meal, you need protein and fat with your low carb Paleo Smoothie. For protein, eat some meat, fish or eggs on the side, or add protein powder or a raw pastured egg. Nuts yield some protein, but don’t use too many – they’re high in Omega 6’s. Bone Broth or gelatin adds protein. Here’s the link to the blue cap gelatin from Vital Proteins. It dissolves in cold water – the green cap does not. Eat fats on the side with your protein, or blend in avocado, oil or nuts. You’ll get hungry if you leave out the fat. 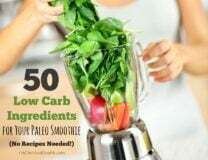 This blog post has a full ingredient list of all the things I’ve used to make my own paleo smoothies or low-carb smoothie bowl. Print it out before you go shopping! And there’s no recipes required! I’ve used all three. 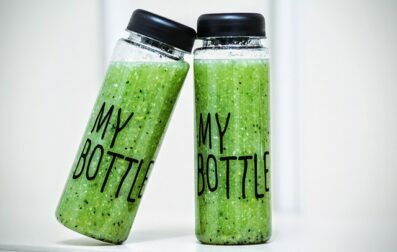 My recommendation is use the one you already have, but if buying one, the Nutri Bullet is fine for one person or one smoothie at time. If you’re making them for several people or enough for several servings, consider the bigger blenders. The Nutri Bullet works surprisingly well when I stuff it full of romaine, cucumber, fennel bulb, avocado, zucchini and berries. I can blend it down once and then add more food and reblend. I eat it with some buttery fish or chicken and I’m full! Note: if the food doesn’t fall down into the Nutri Bullet blade, remove the jar, tap sharply on your hand and try again. Don’t burn out its little motor! Or add another tablespoon of fluid. If you make enough for a second serving later, eat it soon – maybe within 3 hours – to keep the enzymes alive and the raw food fresh.